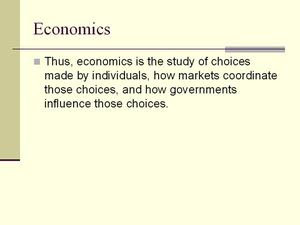 The term Economics is comprised of two terms : "okios" and "nomos". "Okios" means household,estate,family etc. whereas "nomos" stands for law,rule,custom etc. Thus definiton of Economics can be defined as "Economic logic that is implemented for the solution of a problem in which we have to make a choice under scarcity of resources"
We can also define Economics as "A Social Science which is involved in the study of human behaviour and activity whose ultimate aim is to satisfy the requirements of the people or the society as a whole." # "Economics is the Science of wealth"
# "The Science relating to the laws of production, distribution and exchange"
# "Economics is concerned with an enquiry into the nature and causes of wealth of nations"
"It is not from the benevolence of butcher, the Brewer or the Baker that we expect our dinner, but from their regard to their own self-interest." Initially the focus of Economics was on "Wealth" and later it shifted to "Welfare". (b) Economic activities of people who are not significantly involved in above two processes are not included in Wealth Economics. (c) Non-productive activity is considered as a cost on Society. (d) Wealth is placed above the life of the people i.e. Wealth takes the primary position and Man the secondary position. Due to above shortcomings, the focus shifted from Wealth Economics to Welfare Economics. (a) It involves the study of well being of the Human society and not of the money alone. (b) Policies were made in order to attain human welfare and social well being.